The most recent ballet vanity project, Intensio (produced by the Joyce Theater), is led by ABT principal Daniil Simkin, who is joined by some talented pals from ABT and Céline Cassone of Les Ballets Jazz de Montreal. While watching these fantastic art-letes provides many pleasures, the evening also raises questions. Are these already accomplished stars drawing resources—money, publicity, presenters—away from independent choreographers? If those indie artists are not able to attract donor and foundation support like the top ballet stars, how is their work produced—does it mean life or death? Socio-artistic issues aside, Simkin does have an unusual story, which is told cursorily in a humorous autobiographical piece with "balletography" by Ekman titled Simkin and the Stage (2015). Born in Siberia and raised in Germany, Simkin was taught ballet at home by his mother; his father designs sets including for Intensio's big finale, Islands of Memories. Throughout the program, we absorb Simkin's brilliance and rough edges, a diamond still in the process of being polished. At times his brio blankets his weaknesses; charm goes a long way. In front of a projected film of Simkin either repeatedly pirouetting, or training as an adorable child, the real Daniil performs a kind of highlight reel of his most eye-catching moves, such as leaps and tours in the air. His recorded voice tells us his story, and he humorously mimes nuggets like, "I wanted to be a dentist." Preceding this work is a hilarious film (that has been posted online for awhile) of Simkin going about his daily routine on the streets of New York, dressed in white tights and princely tunic and using only ballet vocabulary. These are the most personal works on an otherwise broader slate. Simkin appears in Jorma Elo's Nocturne/Etude/Prelude, a trio with Isabella Boylston and James Whiteside, whose brown hair is now light blue (presumably to age him, but it just looks like cotton candy). Is he an older version of the identically dressed Simkin, his father, or just another man? The dance is a showcase for Boylston, chic in a one-shouldered white dress with a circle skirt (costumes coordinated by Maile Okamura). While the larger men seem huge in the modest-sized Joyce stage, the women—Boylston in particular—appear more vivid, limbs longer than at their normal venues, the Met and Koch. Elo adds dramatic touches, such as Whiteside dropping Boylston into a split and lifting her quickly, and Simkin flexing his hands, palm meat pressed together as he pirouettes. Gregory Dolbashian's Welcome a Stranger (2015) is more edgy, announced immediately by ambient fog and looped percussion, which cedes to a guitar. Céline Cassone (who set the punk tone with her flame-red hair), Blaine Hoven, Alex Hammoudi, Calvin Royal, and Cassandra Trenary gather, lift one dancer up and over another ("gang chaos partnering," in my notes), disperse, and exit; the movement has an urgency and desperation. Royal shines in a brief solo. His long arms sweep like wings, his phrasing plushly muscular. Hoven and Cassone experiment with one another's weight, actions and reactions. Islands of Memories is choreographed by Annabelle Lopez Ochoa to a "recomposition" of Vivaldi's Four Seasons by Max Richter. 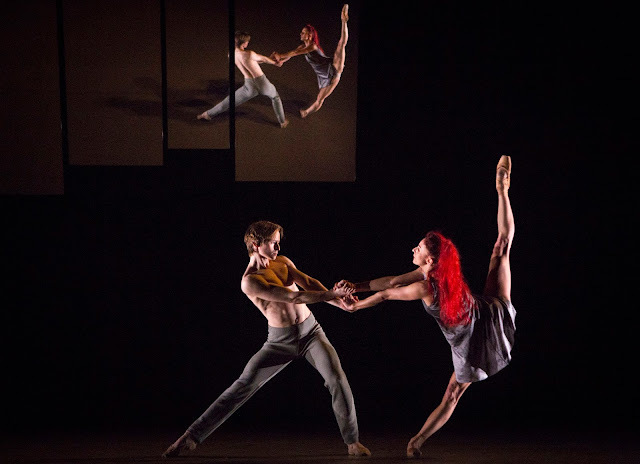 Dmitrij Simkin designed the nifty set: canted mirror panels show us the stage from above, onto which projected patterns outline and react to the dancers' movements. Ochoa's movement is fluent, elegant, and the dancers look happy doing it. They pair off, springing on and offstage like gazelles. Trenary shows ferocity, and looks fantastic paired with Royal. A woman's pointed toe becomes a protractor pencil tracing a circle around her body, being spun by her partner. Boylston displays her high arches in deep plies. In the group finale, Simkin is one of the gang—the slender kid who can match his mates' spins and jumps—but also the guy who brought the game ball.